Have you ever perused the many blogs and listicles of failed attempts at Pinterest-worthy crafts? We've all been there — you see a gorgeous DIY online, your eyes get big, and your dreams get bigger. Then you try it, and the result is, in a word, pathetic. We've found the same is true with a good manicure. Especially when your wallet is in a bind, getting your DIY on seems like an obvious choice, but sometimes the final product is just missing that shiny, smudge-free, no-streak crispness that comes with a salon job. While we can't bless you with a steadier hand, we can provide you with tips from one of NYC's most beloved nail artists, Madeline Poole. Poole has her own special technique that she pioneered because "nail polish is a tricky substance, it dries quickly, so it tends to become goopy if messed around with too long. The method I use is a quick way to evenly cover the surface and avoid drying out the brush." She gave us the full low-down on her special techniques, and we turned it into a handy, shareable infographic. 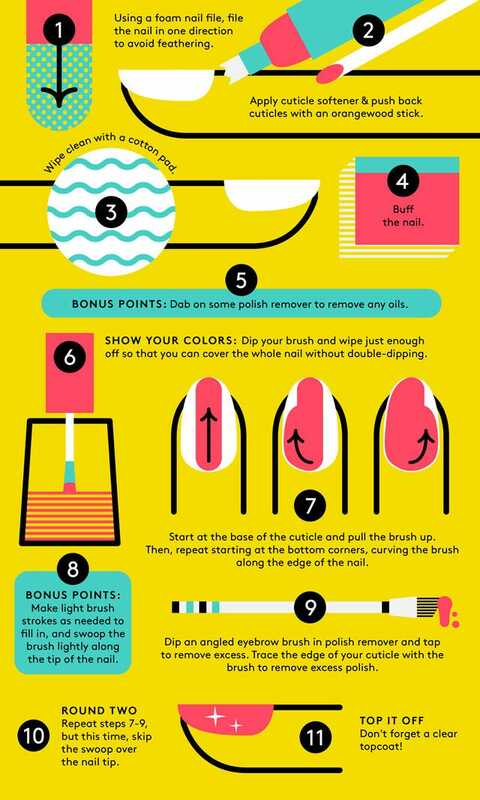 Nothing fancy, totally foolproof — just the very basics on how to paint your nails at home, and not feel like a failure after the fact.